This year Scoil Mhuire Magherarney was part of the Peace Proms Choir 2016 with the Cross Border Orchestra of Ireland or the CBOI. The main idea of the Peace Proms is to bring people from both sides of the border together through music. Third to sixth class took part in the choir with Ms Groarke and Ms Payne. Our main concert took place in the Simmons Court in the RDS, Dublin on Sunday the 7th of February 2016. The first thing we had to do was learn all the songs and actions. When we got them we started learning them straight away. Every day we would spend at least half an hour learning them. As part of our preparation we had a workshop with half of the choir in the National Show Centre in Dublin. We met our conductor there, Greg Beardsell, who helped us with the songs and actions. On Sunday the 7th of February we were finally ready for the big concert. We all came into the school at 8.30a.m. in the morning. We went to our separate classrooms and Ms Payne and Ms Groarke made sure we were all there. Once we were ready we got on the bus, sat in our seats and started our journey. It was a long journey but we had plenty of things to do like playing games with each other and talking to each other. After a long time we arrived at the Simmons Court in the RDS Dublin. The bus driver parked the bus and we were all now feeling very excited. Soon after that we got off the bus and went into the building. It was very big and open. We went to the yellow section of the seating area and took our seats. There was some time left so we took a small snack and left some for later. When all of the schools were ready we had a quick rehearsal with the Orchestra. Greg Beardsell was there conducting the Orchestra but giving us signals like how long to hold a note for. When we were finished the rehearsal all the parents started to arrive and take their seats. The lights were suddenly turned off and Greg was introduced. The orchestra played Mission Impossible as their opening number and then Greg introduced us, the Peace Proms Choir for our first song. We sang “Touch the Sky” from the movie” Brave” first. We also sang the “Power of the Dream” and the “World in Union”. Both of those songs were sung by two separate soloists and we were only doing the chorus. Another soloist sang and after that we did the “Friends” medley with the actions. We ate the rest of our lunch during the interval and we went to the toilets if we needed. The second half started a bit differently. Star War characters came on to the stage. They did a walk around the audience and back on the stage. No one was expecting that! In this half we would be singing the Pop medley, Matilda , Ireland’s Call, Imagine and Your the Voice. Your the Voice was sang by another soloist who was a girl from Monaghan. After the show some of our parents took us home but some followed the teachers back onto the bus and we started our journey back. We pulled into Apple Green and got something to eat at Burger King. When we were finished we got onto the bus. We were all tired but that didn’t stop us playing and chatting. When we arrived back at the school we waited for our parents to pick us up. After all of that our Peace Prom journey 2016 was over. I enjoyed being a part of the Peace Prom Choir. The Cross Border Orchestra of Ireland sounded very good. It was also the first time that I sang with an Orchestra. This year Scoil Mhuire is taking part in the Cross Border Orchestra of Ireland Peace Proms Choir. 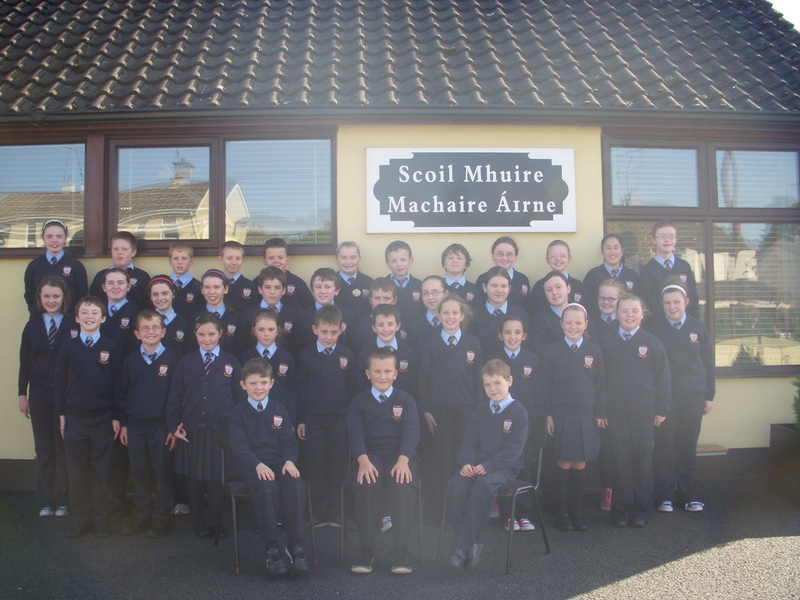 Our choir is made up of pupils from third, fourth, fifth and sixth class. We have been busy learning our selected songs and their arrangements over the past number of weeks and now we have started to add a few dance moves! On Thursday, January 16th we all went to DCU-Dublin City University for a workshop with the orchestra's conductor. What a surprise we got when we saw the hundreds of other children and we were even more surprised that this was in fact only about one third of the choir that will sing at our concert date. We can only imagine what a sound we will all make together on the day! Our concert is taking place in The City West Conference Centre on Sunday, February 2nd at 2p.m. sharp. We can't wait to see the live orchestra and all its sections that we have learned about like the brass section and the woodwind not to mention the string section and of course we can't wait to sing live with the orchestra. It's going to be a day to remember! Why not listen to some of our rehearsals! Here we are in the early days of learning some of the songs. Not perfect and plenty for us to work on but it will give you an idea of what we are busy practicing. Our Peace Proms Concert - Oh What a Day! On Sunday the 2nd of February we went to our Peace Proms concert in Dublin. Rang a trí, ceathair, cúig agus sé with Ms Payne, Ms Fitzpatrick, Brenda our SNA and Olivia McCaffrey our parental volunteer all travelled on the bus. It was an early start as we headed for The City West Conference Centre in Dublin. The Cross Border Orchestra of Ireland arrived at the same time as our bus. The orchestra is made up of young people from north and south of the border. There were choirs from schools all around the country. Our conductors name was Gearóid Grant. There was a tenor and his name was Emmanuel Lawler. Emmanuel also hosted the concert, introducing all the songs and special guests as well as singing himself. One of the guests was Patricia Tracey. She was a violinist. A man who's name was Patrick Martin was at the Peace Proms too and he played the Uilleann pipes. When we got there we went to our seats. We rehearsed for a while. We got our first glimpse of the orchestra. They were fantastic. We couldn't believe how young some of the musicians were, the same age as some of us! We rehearsed some of our songs with Gearóid. We practiced some call and answer singing - that is where one half of the choir sings a line of the song and then the other half answers with their line. It is important to watch the conductor as he tells the groups when to call and answer and when to sing louder. He put his hand up to his ear and we knew that this meant he wanted us to sing out even louder still! Soon it was time for lunch. We all had to bring our own packed lunch, even the teachers. We went into a big, big room with lots of other schools. There were children in white tops just about everywhere! We found ourselves a little area and we sat down and ate our lunches. Teacher had a bin bag to collect all our rubbish in. Next we went back down stairs and lined up to use the toilets. Concert time was getting closer and we were getting more and more excited. When everyone had used the toilets we made our way back to our seats. Our school was so, so lucky because we were the first group sitting right behind the orchestra. Just in front of us was the percussion section. We were busy spotting lots of our Mums, Dads and families in the audience. Ms Payne was busy telling us to wave so our families could spot us amongst all the other schools. The lights went down and immediately the show started. The orchestra began with music from one of our favourite films - Pirates of the Caribbean. Before long it was time for our first song. The sound from the full choir was amazing. We sang other songs like Dance Evolution. We sang them all with great cheer. Then out of nowhere came a Scottish Marching Band. They had bagpipes and drums. They played great music on their own and then they played with the orchestra. Although they were playing Scottish instruments and Scottish music they were actually from Ireland. In the middle of the show two Irish dancers and a jazz dancer got up. A few minutes into it we realised it was a dance off! It was really good. We sang all our other songs and did dance movements to some. It was such fun. Soon we came to the very first song we had learned with Ms Payne, 'Crossing Borders'. It was sad because although it is a lovely song we knew we were singing our last song of the concert. When we were finished singing we gave a bow and the crowd were cheering and clapping loudly. We were stars! We all had such a great day. It was so much fun and we really, really, really enjoyed it. It was a very different experience and we so hope that maybe we might get to do it again some day. Thank you to the Cross Border Orchestra of Ireland and our conductor Gearóid. We hope you liked our singing.